Imagine finding yourself in a catastrophic emergency situation and not having any stockpiles of food on hand to get you through it. Whether it’s an earthquake, tornado, hurricane, flood, civil unrest, or any other emergency situation, the food supply chain can easily break down for days before everything is back under control and the trucks start making deliveries again. The grocery store shelves become empty almost immediately because most stores only keep a couple of days’ worth of food on hand, relying on the supply chain to deliver more as they need it. When a natural disaster or other emergency situation happens, everyone flocks to the grocery store and the shelves are bare within hours. And since the trucks can not make deliveries, there won’t be any more food available until the emergency situation has been resolved, which could take days or even weeks. This is why smart survivalists always keep at least a few days’ worth of food stockpiled to ensure that the needs of themselves and their loved ones are met. These ready-to-eat emergency food rations will solve that problem quickly and easily. With twenty packs, each containing nine meal units of 400 calories each, you will have the food you need with no preparation required. And unlike some similar products, every portion is individually measured and segmented so you don’t have to break them apart and make a mess. Previous buyers of this emergency survival product on Amazon have been very happy, rating it an average of 4.8 out of 5 stars. The promises made by the manufacturer regarding the taste and the convenience of the packaging are confirmed by their positive reviews. 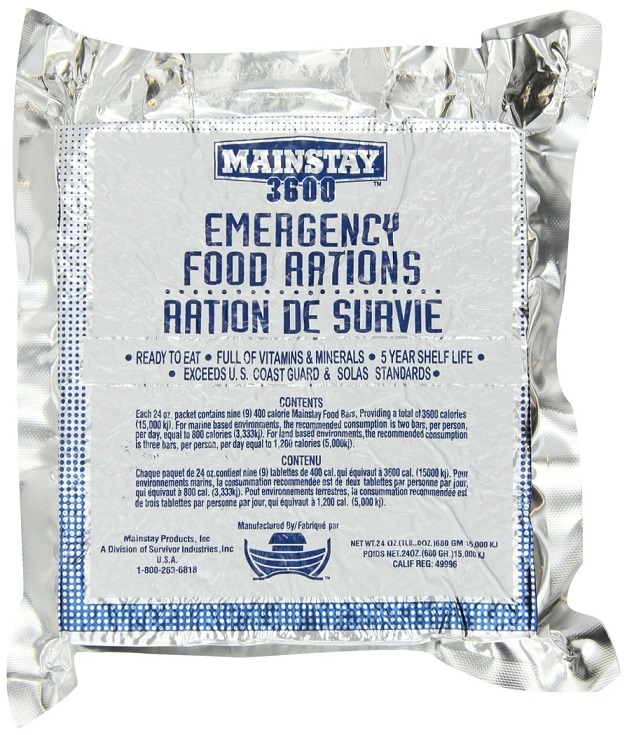 These emergency food rations by Mainstay are a great item to have on hand, ensuring that your food needs are met in any situation where food supplies are not readily available. The Ultimate Zombie Survival Gear? « If Preppers are the Punch Line, What is the Joke?